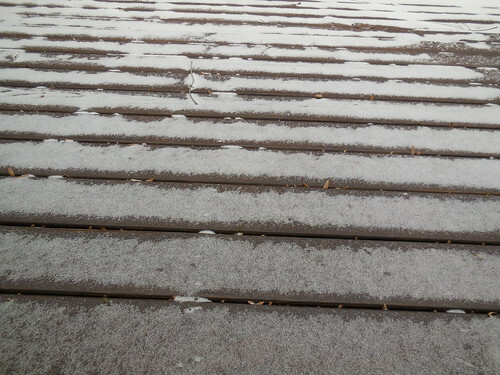 Snowy Deck, a photo by nikki49d on Flickr. When I was uploading my photos I found it very easy and intuitive. It was great to just be able to drag the photos from my desktop onto the website. Sometimes it is frustrating to try and locate the photo you want when you are using a browse feature. I can only think of a few ways I would use Flickr in my classroom, after a field trip or maybe a photo scavenger hunt. For example I made an assignment for my pretend class to find Greek Gods/Heroes in today's world. This could be an excellent place for the students to load photos they find of these examples. I have used Snapfish and Pintrest a lot in the past. I like to use Pintrest to find new crafts but also to upload my accomplishments after I am done. This way someone else can use my idea and make it their own. I use Snapfish to share photos with my family. For example during the holiday season we all took a lot of photos. Rather than trying to send them to each other we all upload our photos to Snapfish. This way we can pick and choose which ones to print/save on our computer. I like using Snapfish because it only shows the photos to the people I request them to be sent to. I really do not enjoy having my personal photos being viewed by strangers. It is good for Flickr to have a private setting. There are some photos I might not mind letting the public see. Such as a pretty sunset or the blizzard photos. Anything with my family members I would like to keep to just people I know. It may seem paranoid but you don't know who is out there. How do you set your privacy settings when sing social media?